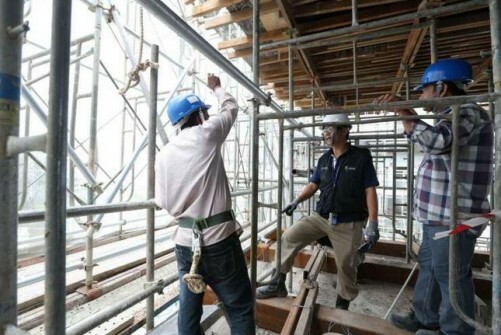 SINGAPORE - The maximum amount of compensation for workplace-related injuries will be raised by about 20 per cent from next year. From Jan 1, employers will be liable for a minimum of $69,000 and a maximum of $204,000 in the event of a workplace death under the Work Injury Compensation Act. If a worker suffers total permanent incapacity, it will range between $88,000 and $262,000. The cap on medical expenses will also be increased from $30,000 to $36,000, Minister for Manpower Lim Swee Say told 1,200 industry players on Wednesday evening at the annual Workplace Safety and Health Awards. "The last time we made such adjustments was in 2012, so it's time we keep up with wage increase and increase in medical costs," he said. In another change, expenses that facilitate an injured worker's return to work will be claimable under the Act from next year. This will cover charges for treatments such as physiotherapy, occupational and speech therapy, and worksite assessment. "Research has shown that the longer the injured workers are absent from work, the lower the chances of them returning," said Mr Lim. An early return to work "not only provides better financial security to the worker, it also contributes positively to his physical and mental well-being," he added. In total, 191 companies and individuals were recognised for their efforts in improving workplace safety and health at the ceremony at Resorts World Sentosa.